Well before I write an actual movie review, I thought I’d throw this up after I went with some IMAX noobs at one of my viewings of Avatar…My friend’s friend waited over 3 hrs in line, alone, being about 20th from the front. What’s he do once he goes in? He sits 4 rows from the front bar. Which is good for a normal theater, but the front bar in a true IMAX is essentially the *very front* (as opposed to a LieMAX). Head and neck aches ensued. From that position, the 3D didn’t sync on the far right and left unless you actually turned your head to look directly at it. I don’t fault him; he didn’t know any better. Poor guy, all that time spent waiting. Anyway, this is primarily for Avatar-style 3D, but I suspect movies using that technology will continue to trickle in. A major component of Avatar is the immersion, so you might as well see it as it was intended and see where all that spending went, right? I’ve seen Avatar in 3D from various positions now, and I can tell you that more than any other movie I’ve seen before, positioning really had a large affect on my enjoyment of the film. With regular 2D film, it’s clear that you’re watching a flat projected image coming from a projector. But with “Cameron”-style 3D, the movie makes you feel as if you’re there. Until Total Recall technology comes around, Avatar 3D is going to be the closest to traveling to another habitable planet any of us will ever get. I really don’t think 2D or Bluray is going to do this movie justice. A true IMAX 3D is the best way to see it in my opinion, despite what I said in the previous post on the differing 3D technology. 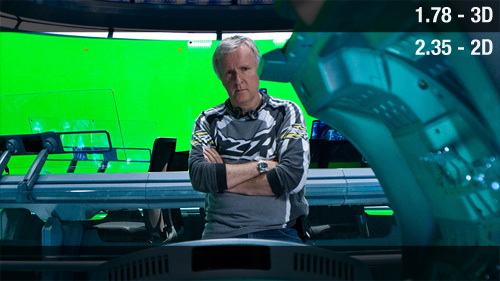 The IMAX version has the full 1.78:1 (16:9) cut of the film, while the 2D and non-IMAX 3D cuts are 2.35:1. I ran the numbers, and we’re talking about a 25% loss in vertical image going from the IMAX cut to the non-IMAX cut. If anyone knows what cut the LieMAX screens are showing, I’d appreciate it. For a true IMAX screen, I found 5 rows from the top is very good (this is specifically true of the true IMAX in Irvine. Your mileage may vary). It optimally puts the whole screen in your field of vision, without requiring you to move your neck side to side to see what’s on the left and right. You’re also vertically centered, so you don’t need to crane your neck up either. For all intents and purposes, the top of the IMAX is analogous to the center in a regular theater. So anywhere in the back is good. The front is the face-f**k zone. I got a little dizzy sitting that close. Plus as I mentioned before, the 3D on the sides weren’t syncing sitting that closely unless I physically turned my head to look. For a regular, non-IMAX screen, the back is terrible. Normally I’d say the back is fine for any other film, but with the immersion factor of Avatar, sitting in the back kind of ruins it. I could see speakers and the walls of the theater in my peripheral vision. It was like watching real life Picture-in-Picture. So in this case, you’d want to sit in the middle, probably near the bar. I haven’t seen Avatar in a LieMax, but since they’re just up-converted regular theaters, I’d guess the middle would be where to go. Well, hope that helps some people out there. This entry was posted by Ron on Friday, January 1st, 2010 at 7:06 pm	and is filed under Moving Pictures, Technology. You can follow any responses to this entry through the RSS 2.0 feed. You can leave a response, or trackback from your own site. No problem! Let me know how your seats were! Thanks for the tips! We almost got back row, but opted for 6 rows from the front. On the way to see it tonight. Hi Dave, what kind of theater are you seeing it at? I saw avatar at imax with my boy the first day it came out and sat dead center half way up. Most amazing movie experiance I ve ever had. Today I m watching it with my gf and the only center seats that were available r top row…..we ll c how it is kinda dissapointed on how. Early I have to get in line justt for seats, too bad upon purchace seats cannot be picked, mayb n the future??? Thanks for the tip. In line for IMAX 3D.